协会：根据离差智商，按智商排序，排名前0.1%者的智商约为146.4 (SD=15)。 我们不屑于以智商数值自居，但是这里的每一位合格会员，都需要经过一些专业测试的筛选。 此协会并不是一个高高在上的“象牙塔”，而是一个平等交流的平台，为千分之一人群提供交流和发展的机会。我们期待着你的加入。By definition of the deviation system, the IQ of the top 0.1% percent of the unselected adult population is approximately 146.4 (SD=15). 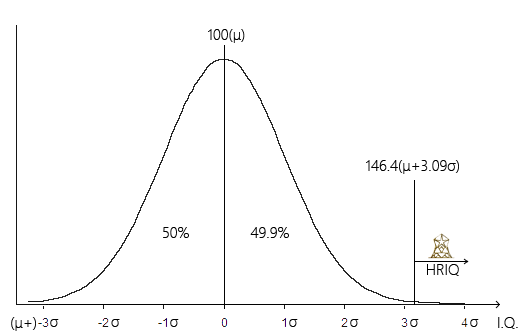 We do no endorse boasting of IQ scores, but every member of our society has undergone rigorous examinations to ensure an IQ level at or above the top 0.1% of the unselected population. HRIQ is not an elitist organization, it is a fair and equal platform created solely for the linking of minds. We welcome you to join us. 个人资料页网址(?→会员编号或个人设置的字母链接)Profile url(?→Member ID or personal link)：m.hriq.net/?